I was asked to write something about Halloween. I'm afraid I'm not into scary Halloween stories, but I can write about personal experiences. 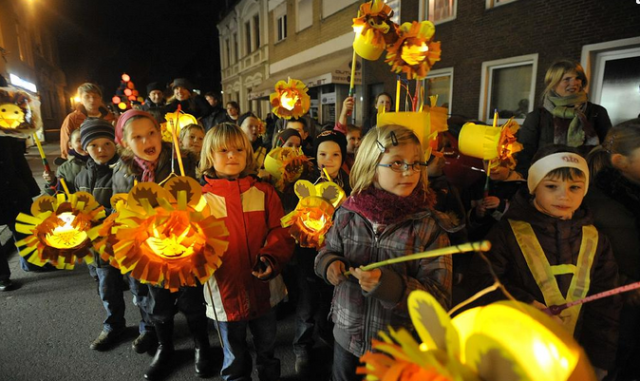 In parts of the Netherlands the 11th of November has been celebrated for centuries. It's named St.Maarten after the Saint Bishop Martinus van Tours who lived from AD 316 till AD 397. Since the 1920's the festivities have spread around the whole of the Netherlands. Suddenly it was celebrated in my city too; very surprising because people in the region are mainly protestants so they would not have anything with saints. The attraction for children is the candy that they can collect with just walking around with lampions, ringing doorbells and singing a silly song about "cows that have tails". 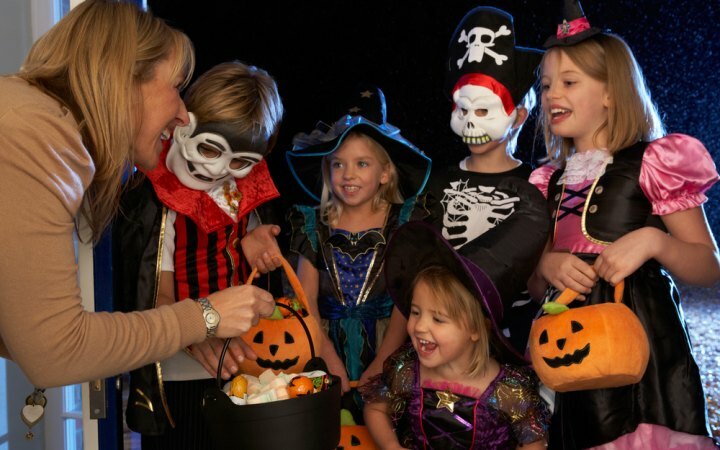 They don't need to tell me this, but when you open the door and the group of little brats start singing, with their parents behind them in silent admiration, there is not a lot else you can do but to put some candy in the sticky hands. The parents nod approvingly, they all go to the next door and you can only hope your doorbell will not ring again. Mostly this is in vain, within 10 minutes the next group will pop up. My children were pleasantly surprised with this show of generosity and they decided to do this too the next year. So we bought them each a lampion and we were ready to go along, but the two of them pleaded us to let them do this by themselves. We agreed that they would try to go along with another group. So off they went. We already had listened to the stupid song three times when my daughters came home again in a very angry state. They had been chased away by the other children and their parents. "We don't go to the same church and school, so they don't want us to walk along. And people opened their doors for us and accused us that we had been there before, so wanting a double treat. We hate it, won't do it ever again!" So we gave them some of the candy we had in store for the little singers and thought that was it. The next year, on the 31st of October the groups of children popped up in front of our door, just dressed a little silly. No song this time, just sticking their greedy hands out. The parents watched it silently again from a distance. People seemed to have decided to celebrate Halloween. This American thing was new to us and we were not very prepared for an invasion of children. We did have some tangerines and gave them to these kids. A good thing too, better for their teeth and a bit of help to prevent them to become obese. Lucky for us we had less children ringing at the doorbell that night. The next day we saw how they had appreciated our fruit. Some was smashed against walls, the rest was thrown on the street. We had enough of it all! I could already foresee the same children coming to our door on the 11th of November; of course St.Maarten would not be skipped. I was right, they did go around again. This time without silly costumes, but with their lampions. I had unscrewed the doorbell and drawn all the curtains. There were fruitless attempts to ring the doorbell, they would knock and bang at the door too. But I was determined: no more of this. The next day we could see that they had spit all over our door. We cleaned it and that was all. The next two years we had to get the saliva from the door on both celebrations. After that they just left us in peace and my children never again tried to mingle with these children.